Silent Pocket ® is the leader in analog privacy, security and health. Our patented Faraday cage technology is conveniently embedded into fashionable accessories to block wireless signal. We have developed a core collection of enhanced wallets, bags and phone cases that represent a balance between utility, function and aesthetics. We've partnered with Silent Pocket ® because we view their Faraday bags, RFID secure wallets and other analog accessories as a critical tool in helping you better secure your Digital cargo. Use code BLACKSITE to get 15% off your order today. The Faraday Backpack is a roll down, waterproof bag, waterproof backpack, and Faraday cage bag that blocks ALL signals to and from your wireless device(s). ie Computer, Smart Phones, Tablet, etc. It renders you completely off the grid. Made of Waterproof 400D Nylon with high frequency welded seams, it's the most advanced waterproof, Faraday backpack on the market today! The Faraday Laptop and Tablet Sleeve will instantly enhance your daily privacy, security and valuable data stored on your computer or tablet. Made of durable waterproof woven nylon with our internal patented radio frequency (RF) Faraday cage, we offer your device the most valuable physical and wireless protection. This sleeve is a soft case for when you want to be undetectable, untraceable and unhackable. The Faraday Cage Sleeve Collection instantly enhances your daily privacy, security and valuable data. Made of top grain cow leather with our internal patented radio frequency (RF) Faraday cage, we offer your device the most valuable physical and wireless protection. This sleeve is a soft case for when you want to be undetectable, untraceable and unhackable. The Nylon Faraday Phone Sleeve is an amazing non-leather option to instantly secure your phone's data, location, privacy and general security. Made of durable woven nylon with our internal patented radio frequency (RF) Faraday cage, we offer your device the most valuable physical and wireless protection. This sleeve is a soft case for when you want to be undetectable, untraceable and unhackable. This simple zip up Carryall Clutch is the perfect travel or daily companion to keep your belongings portable and secure. It has an internal compartment to shield RFID and NFC and comes equipped with six card slots and plenty of room for currency, keys, and small documents. Keep your passport, credit cards, and chipped items secure! smart keys are vulnerable to attack from hackers, allowing them access to your car, including starting the ignition and driving away with it! You need a key fob protector or else a thief can use a cheap signal amplifier to steal everything in your car, or in some cases steal the car itself! The Key Fob Guard is a privacy and security case for your key fob or keyless entry fob. It is a single sleeve that blocks the wireless connection from your key fob to your car. The Silent Pocket Faraday Laptop Cage Sleeve + Angel Armor Ally One Armored Panel is designed to secure your sensitive data and protect you. Created with business executives, government officials, and travelers in mind to securely store laptops and to prevent data extraction or data wiping. These bundled product solutions give anyone unrivaled peace of mind from real world seen and unseen threats. The Laptop Sleeve features durable woven nylon with Silent Pocket's embedded patented Faraday cage system, instantly blocking all signals to and from your laptop. Angel Armor’s Ally One Armored Panel is concealed on the inside. Weighing less than a pound and a quarter inch thick, this added feature is a lightweight, unnoticeable, travel-friendly, and go anywhere solution against armed assailants. The Faraday Dry Bag Collection is a roll down, waterproof Faraday bag that blocks ALL wireless signals to and from your mobile device(s). It renders any device completely off the grid. Made of durable 210D waterproof Nylon, this bag is designed for travel in unpredictable weather conditions. A must have for all wet environments to keep your electronics dry and secure. Slim vertical style Bi-Fold Wallet with easy slide out tab for hidden cards. Consists of a traditional flip open design with just the right amount of storage and hidden card slot with easy pull out tab. Instant RFID security in a condensed minimal style with three card slots on the left, hidden pull out tab, one card slot on right and billfold on back. The Faraday Cage Dual Collection instantly enhances your daily privacy, security and valuable data. Made of top grain cow leather with our internal patented radio frequency (RF) Faraday cage, we offer your device the most valuable physical and wireless protection. The collection features a unique two Faraday pouch design with zipper and wristlet. Instantly become undetectable, untraceable and unhackable. Blocks ALL Wireless Signal, Cellular, GPS, WiFi, Bluetooth, RFID and NFC. Keeping it sleek and stylish, the never out of style Bi-Fold Wallet consists of a traditional flip open design with just the right amount of storage. 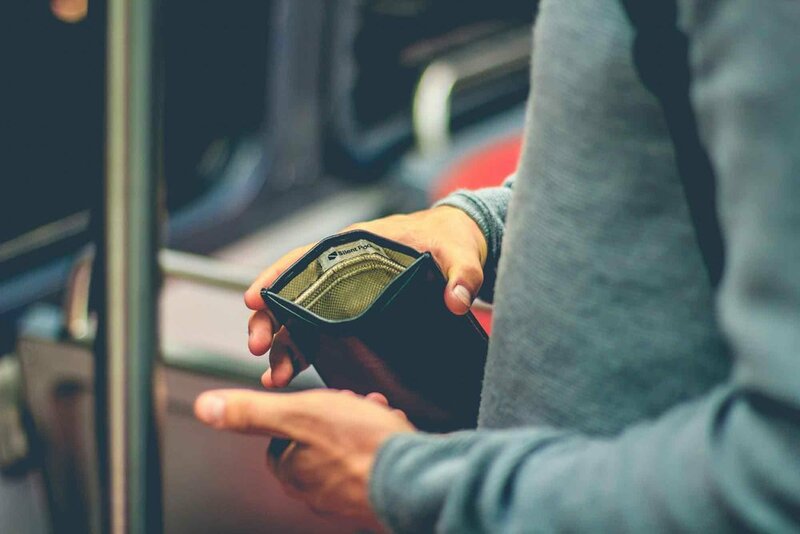 Built for the person looking to conceal cash and their identity, this RFID secure wallet contains three card slots on the left and right side, with a small pocket under each and billfold in the back, all offering RFID protection. The Simple Passport Wallet is your confidant in global adventure. Designed with the savvy traveler in mind, we focused on a minimal layout with two angled passport sleeves, real cow leather and the added benefit of RFID security. You are now free to travel with ultimate peace of mind. Why does every app on your phone, tablet, or computer ask to access your camera?! Like to think about it or not, eavesdropping on your device is happening. Simply place a Camera Privacy Sticker over any lens when not in use and have the peace of mind you deserve. Place on all lenses: phone, tablet, laptop, computer, etc. The Keyport Pivot is a premium key organizer and everyday carry consolidation device. It can combine up to 9 of your normal keys along with handy tools such as a pen, flash drive, or an LED light (tools sold separately).